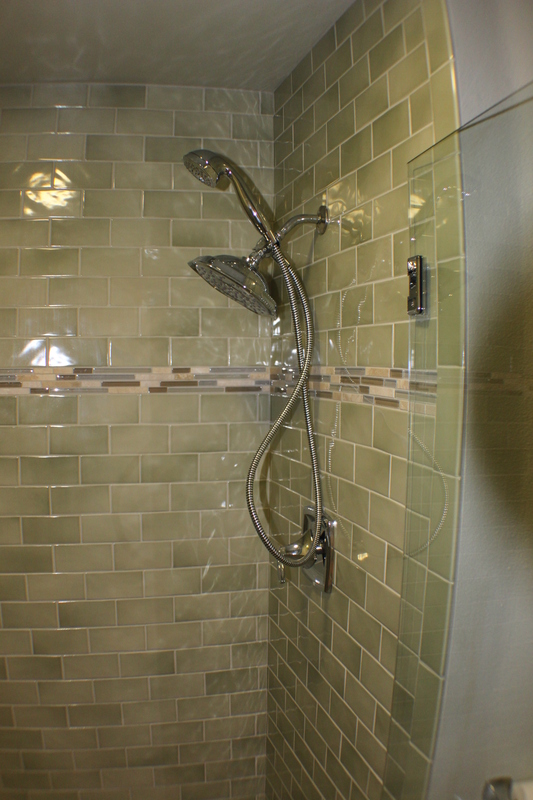 Soothing pale green shower tile, with frameless glass shower door. The first thing to consider is your design scheme. The most popular design trends for small remodeled bathrooms includes modern and contemporary styles. These themes work best for small spaces because they are simple, clean designs. The best small bathroom color schemes include neutral tones such as creams, whites, and browns; cool shades such as blues and grays, and earthy hues like greens and browns. These color palettes are calming and brighten up the room, helping to create the illusion of space. Paired with natural lighting from windows and bright light fixtures, these colors expand the room to prevent the cramped and confined feeling associated with small rooms! Recommended small bath tile ideas include ceramics, porcelain, granite, slate and glass. These are moisture resistant so are good choices for the bathroom, and will hold up against daily use. Less expensive alternatives for flooring are linoleum and vinyl. Popular shower design ideas use tiles that are the same color as the wall paint because it blends the two aspects of the room together and creates a more open feel. If you prefer a different colored shower or tub, the best choices are whites or creams. Again, the neutral tones are bright and visually expand the area. Enclosed shower stalls are surrounded in tile with glass doors. Size depends on the dimensions of the room. Instead of tile one can choose the less expensive shower walls made of plastic or fiberglass. Shower/tub combinations are the best bathtub fixtures for a small bathroom, if you want to keep the tub. Some opt to forgo the tub, especially if there is another bathroom in the house that has a tub. Small master baths can also incorporate a small jacuzzi tub by eliminating the shower and attaching a hand held spout that can act as both a faucet and a shower head. Install a curtain rod and shower curtain and voila! Because this is such a small room, it is probably difficult to find storage space. Consider installing shelving or cabinets in the wall. Wall mounted shelves and cabinet free up space on the floor and provide an area to store toiletries, towels, and decorations. In place of a hanging mirror over the sink, use a medicine cabinet with a mirrored door to add storage.